Officers committing offenses may be acting upon their own stereotypes or prejudices. Though the majority of police and other law enforcement officers work to protect citizens, there are some instances where police officers infringe upon the rights of individuals in the process of arrest or in other situations. At The Orlow Firm, our attorneys are dedicated to the pursuit of justice, and holding unruly and abusive law enforcement officials responsible for their actions. If you are a victim of any type of malicious prosecution, it is important to contact a lawyer immediately. You usually have only ninety days to file notice of a claim against the police department. Contact our offices to assert your rights against abusive and unlawful law enforcement officers. Being a victim of a law enforcement officer makes the victim feel helpless against the officer and the police agency. Any threatening experience with the law is intimidating and makes the individual feel helpless against the official. Our firm strives to restore victims after suffering injustice from enforcement officials who violated their civil rights. Challenging the government in any legal setting can be extremely difficult and requires a skilled civil rights attorney. Our office is comprised of seasoned attorneys with the passion, experience, and strategies that get results. 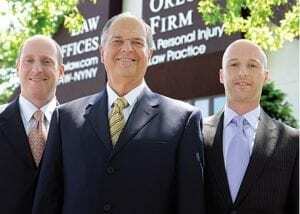 At The Orlow Firm, our father and sons team is dedicated to obtaining justice. We believe that through our work we can protect future victims from police brutality and other civil rights abuses. If you have been a victim of police misconduct, brutality, or false arrest, our attorneys will work to see you recover the compensation you deserve for your abuse and mistreatment. We will come to you if you cannot come to us. Call (646) 647-3398 to speak with one of our qualified and experienced New York City police misconduct lawyers to receive a confidential and honest assessment of your case. * Case expenses are advanced by our firm and are reimbursed to the firm by the client at the conclusion of the case.